As easy as it is to get swept up by the hype surrounding big data, its just as easy for organisations to become discouraged by the challenges they encounter while implementing a big data initiative. Concerns regarding big data skill sets (and the lack thereof), security, the unpredictability of data, unsustainable costs, and the need to make a business case can bring a big data initiative to a screeching halt. However, given big data's power to transform business, it's critical that organisations overcome these challenges and realise the value of big data. The cloud can help organisations to do so. 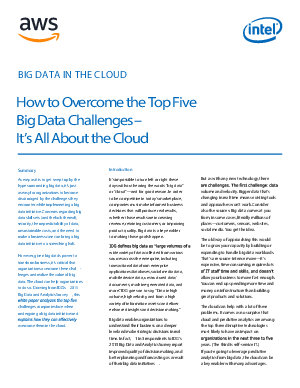 Drawing from IDG's 2015 Big Data and Analytics Survey, this white paper analyses the top five challenges companies face when undergoing a big data initiative and explains how they can effectively overcome them.